Outstanding performances and phenomenal players were witnessed today at the French Open 2018. Marin Cilic and Juan Martin from Men’s Tennis excelled into the quarterfinals. However, Serena Williams on the other hand retired from the French Open after she got an injury problem. 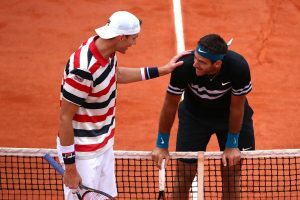 Result: Juan Martin del Potro defeated John Isner at the French Open by 6-4, 6-4, 6-4. A fabulous and outstanding performance was witnessed today on the court between the Argentinean, Juan Martin, and the American Tennis player, John Isner, in the round of 16. Juan Martin won all the sets in a rhythm from John. However, John fought to the end of the match but his luck wasn’t today with him. John Isner took the lead in the first set but wasn’t able to win the set as Juan quickly recovered the points. After the score was 5-4, Martin del Potro won the last point and at last won the first set. Both players looked confident as they scored promptly as soon as one scored after the other. In the second set, the scores were increasing from both sides and was equalized at 3-3. But Juan Martin took a lead from here and grabbed some points which led him in winning the set. Martin del potro won the second set again by 6-4. Although, John Isner scored many points on 12 aces as compared to Martin del Potro who struck only 6 aces. On the other hand, John made 4 double faults whereas Juan made only 1 of them. As the third set started, John Isner again battled against Juan and gave his best in the set. But Juan was already looking towards the next round and won the set by 6-4. It was a very tight match as anybody could have won it but Juan Martin made it to the quarterfinals of the French Open 2018. Juan Martin del Potro’s match is still to be finalized. Result: Marin Cilic defeated Fabio Fognini the French Open 2018 by 6-4, 6-1, 3-6, 6-7(4), 6-3. Outclass and dazzling performance from Marin and Fognini who played at their peak in the whole match. Marin took a very good start in the first two sets as he lead in both of them and won it by 6-4 and 6-1. However, Fognini recovered some points after the lead but failed to win the sets. Marin looked confident in the third set but Fabio Fognini came back in action and took the lead in it. After a tough fight Fabio claimed the third set to his name by 6-3. It was a good start for Fabio as he looked in good form. Soon the third set started and Fabio took the lead. But Marin recovered the points in a very short time and the set came to a tie-break. Nobody knew who would won the set but eventually the Italian,Fognini, stunned the crowd by winning the set. Now the sets were equalized 2-2. It was all down to the fifth set. Fabio again took the lead at the start of the fifth set. He was playing great against the Croatian, when suddenly he got a problem with his ankle. There was a medical timeout for Fognini and the set was started again. But Fabio lost the set to Marin in the end after putting up a very good fight. 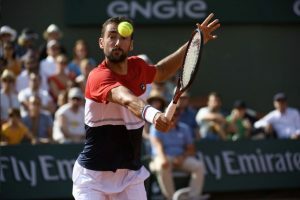 Marin Cilic booked his name into the quarterfinals of the French Open 2018. Marin’s match is still to be decided. Women’s matches were suspended which include the match between Garbine Muguruza and Lesia Tsurenko and the match between Serena Williams and Maria Sharapova. Lesia Tsurenko got injured after Garbine was leading with 2-0. So the match was suspended and Lesia retired from the French Open. Serena Williams on the other hand got an injury to her right pectoral muscle. She wasn’t able to play any furthermore and retired from the French Open 2018. However, Serena told the news that she felt that muscle problem in the third round when she was playing against Julia Gorges. These were the highlights of the second half of the 9th day of Men’s and Women’s Tennis. Join allsportspk, if you haven’t, so that you can see the French Open 2018 day 10.